After 30+ years of “running the Rogue” in drift boats, Vernon Grieve is now working with Dustin Russell for 2019 and beyond. Grants Pass, OR, January 21, 2019 — Grieve's Guide Service has been a family-owned and operated Rogue Wilderness outfitter since 1964. 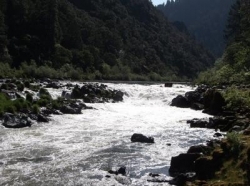 Founded by Kern Grieve, sons Vernon and Donny were raised on the Rogue River, joined the tradition after they came of age, and have carried the company forward in its more than 50 year history. Like the Grieve's, Dustin Russell also grew up fishing on the Rogue and began guiding professionally at the age of 16. In his first year out of high school Dustin was hired by Vernon Grieve and worked with his company for nearly 10 years. During that same time period, Dustin also trekked to Alaska with his first drift boat during the summers and began building his own guide service, Russell Fishing Company. Russell Fishing Company now serves over 500 guests every summer in Alaska, in partnership with five different lodges, and has also been fishing every day during the fall, winter and spring on the Rogue and other Oregon rivers. Having worked for and stayed close with his mentor, Vernon Grieve for nearly 20 years, Dustin is both proud and excited to have the opportunity to come full circle back to his roots, and help carry forward the Grieve's family guide service tradition into the coming decades. In both cases, it is a life-long love for the outdoors and the river that motivates serving guests and sharing this wonderful river experience.